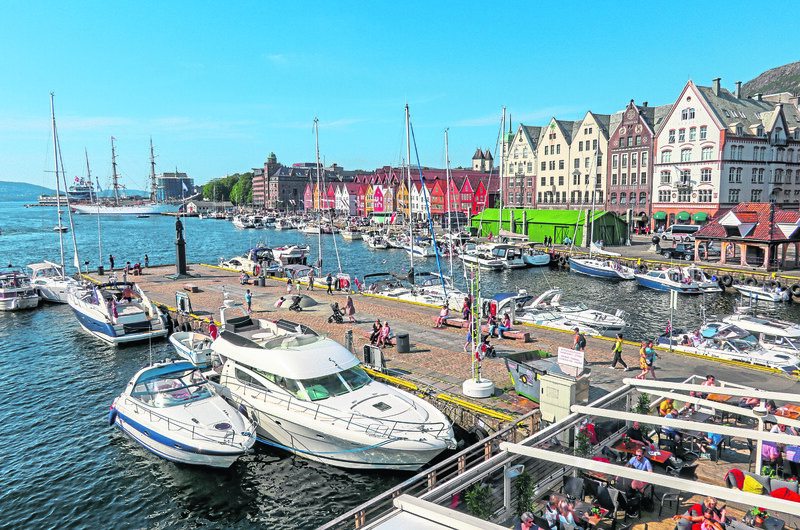 View of historical buildings in Bryggen. There are strategically deployed elbows, selfie sticks raised like periscopes, and, amid a snapping array of pocket-sized smartphones, a few photographers wielding lenses powerful enough to count Ms Kardashian’s porcelain pores, never mind capturing any cellulite she may (or – legal disclaimer – may not) have. But in this instance, the shutterbugs’ insouciant subject isn’t the least bit concerned with craggy dimples peppering supernatural assets because those gob-smacking slopes belong not to a cartoonishly curvaceous celebrity, but to Norway’s extraordinary fjords. I’m on a three-hour journey through the Osterfjord, a round-trip cruise from Bergen – Norway’s second-largest city, after Oslo – to Mostraumen, where brightly-painted houses cling to the water’s edge beneath fir-fringed mountains. As our ferry surges through steel-blue waters, most passengers head to the ship’s bow, straining to spot the next bridal-veil waterfall or red timber-clad home perched in splendid isolation like a lone cardinal in a forest. 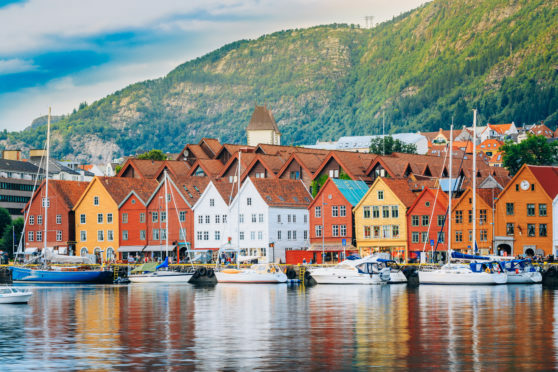 For many visitors to Bergen, this bite-sized voyage may be their only experience of Norway’s famous fjords. Blame the almost inescapable gravitational pull of this cool university city, with its picturesque harbour, colourful clapboard architecture and dynamic coast-to-mountains scenery. In 2015, it was also named a Unesco City of Gastronomy. Take the Taste of Bergen foodie tour or book a beer-tasting at Bryggeriet Restaurant and Microbrewery (good fun even if you don’t know your head from your ale), and you’ll see why Bergen’s culinary kudos are well-deserved. But beyond Bergen, “the gateway to the fjords,” save room for the sweet temptations of the Hardangerfjord, the second-longest fjord in Norway. While on a ferry tour, I strike up a conversation with Edinburgh native Rachel Peach, who is taking a holiday before starting a teaching position in Aberdeenshire. 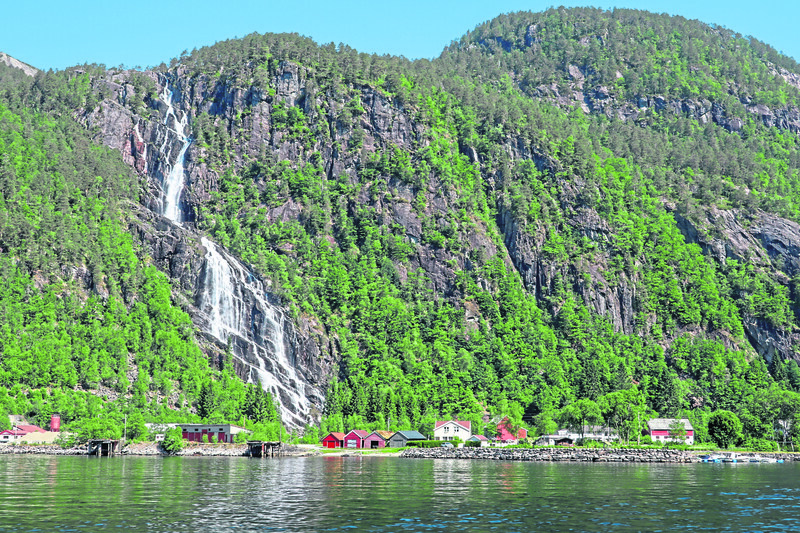 Norway’s most famous waterfall, Vøringfossen, can’t be seen from our boat, but it’s a relatively short drive from the Hardangerfjord port town of Eidfjord. With a total drop of 182 metres, Vøringfossen is actually two separate cascades, which wriggle down opposite sides of a zigzag valley to produce a perpetual rainbow at their base. For me, though, the highlight of the Hardangerfjord is Ulvik, one ferry stop from Eidfjord. With a population barely topping 1,000, this quiet coastal community has just three cafes, two grocery stores, two gift shops, a poetry museum, and a 19th Century church. But mostly, Ulvik is defined by what it doesn’t have. “We don’t have a funicular. We don’t have extreme climbing. It’s just . 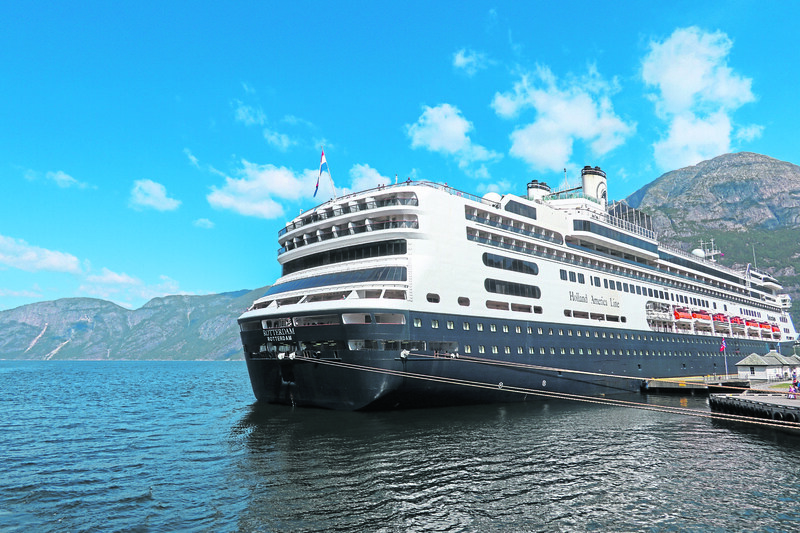 . . nature,” says Vibeke Korsnes, manager of its chamber of commerce and tourism office. That’s more than enough, given Ulvik’s peculiarly mild micro-climate. Sheltered on three sides by mountains to protect it from the wind, it’s a wee Norwegian Eden, with a smattering of steep-roofed houses tucked into hills carpeted by lush orchards, spiky evergreens and green fields. There are hiking trails, cycling, kayaking and fishing, but the “fruit and cider route” is more my speed. 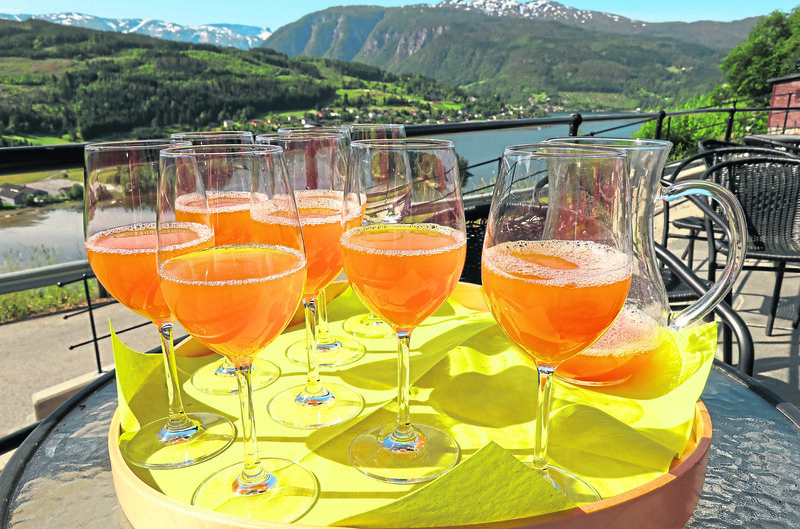 This gently-ascending road above the fjord is dotted with a trio of farms producing cider, fruit juice and, in the case of Hardanger Sider, apple liquor and apple brandy, as well. My favourite is Syse Gard, where Gro Uglenes – a sprightly, spring-loaded woman who could be the poster child for clean country living – shows my friends and me around the farm her husband’s family has owned since 1888 before we sit down to a pre-booked lunch of perfectly seasoned lamb stew, washed down with pure apple juice and two types of hard cider, all made here on site. On a blue-sky, sunny afternoon, however, there’s no finer place to be than the fjord in front of the Hotel Brakanes. With the crystal-clear water highlighted by a swathe of white sand, it could actually pass for the Caribbean on Instagram . . . were it not for the snow-capped mountain peaks beyond. Amy was a guest if Inghams Lakes & Mountains. Bergen and Ulvik form part of Inghams’ Capital to Coast on the Great Bergen Railway escorted group tour. A 10-night tour costs from £1,549 per person, including three and four-star accommodation on bed and breakfast half board basis in Oslo, Ulvik, Bergen and Stavanger, as well as return flights (from London, Manchester and Aberdeen to Oslo, returning from Stavanger), airport transfers the services of a guide throughout, scenic journey on Bergen Railway from Oslo to Voss (with reserved seating and light lunch), guided walk in Ulvik, and ferry cruise from Bergen to Stavanger (with buffet dinner). Package valid for travel departing June 7 and 21 2019, July 5 and 19 2019, and August 2 and 16 2019.